Ocala (/oʊˈkælə/ oh-KAL-ə) is a city in Marion County, Florida, United States, which is part of the northern region of the state. As of the 2017 census, its population, estimated by the United States Census Bureau, was 59,110, making it the 49th most populated city in Florida. It is the seat of Marion County and the principal city of the Ocala, Florida Metropolitan Statistical Area, which had an estimated 2017 population of 354,353. Ocala is located near what is thought to have been the site of Ocale or Ocali, a major Timucua village and chiefdom recorded in the 16th century. The modern city takes its name from the historical village, the name of which is believed to mean "Big Hammock" in the Timucua language. The Spaniard Hernando de Soto's expedition recorded Ocale in 1539 during his exploration through what is today the southeastern United States. Ocale is not mentioned in later Spanish accounts; it appears to have been abandoned in the wake of de Soto's attack. In the late eighteenth and early nineteenth centuries, Creek people and other Native Americans, and free and fugitive African Americans sought refuge in Florida. The Seminole people formed. After foreign colonial rule shifted between Spain and Great Britain and back again, in 1821 the United States acquired the territory of Florida. After warfare to the north, in 1827 the U.S. Army built Fort King near the present site of Ocala as a buffer between the Seminole, who had long occupied the area, and white settlers moving into the region. The fort was an important base during the Second Seminole War and later served in 1844 as the first courthouse for Marion County. 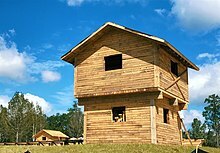 A reconstructed Fort King in 2017. The modern city of Ocala, which was established in 1849, developed around the fort site. Greater Ocala is known as the "Kingdom of the Sun". Plantations and other agricultural development dependent on slave labor were prevalent in the region. Ocala was an important center of citrus production until the Great Freeze of 1894–1895. Rail service reached Ocala in June 1881, encouraging economic development with greater access to markets for produce. Two years later, much of the Ocala downtown area was destroyed by fire on Thanksgiving Day, 1883. The city encouraged rebuilding with brick, granite and steel rather than lumber. By 1888, Ocala was known statewide as "The Brick City". In December 1890, the Farmers' Alliance and Industrial Union, a forerunner of the Populist Party, held its national convention in Ocala. At the convention, the Alliance adopted a platform that would become known as the "Ocala Demands". This platform included abolition of national banks, promoting low-interest government loans, free and unlimited coinage of silver, reclamation of excess railroad lands by the government, a graduated income tax, and direct election of United States senators. Most of the "Ocala Demands" were to become part of the Populist Party platform. The first thoroughbred horse farm in Florida was developed in Marion County in 1943 by Carl G. Rose. Other farms were developed, making Ocala the center of a horse-breeding area. Local horses have won individual races of the Triple Crown series; in 1978 Affirmed, bred and trained in Marion County, won all three races, boosting interest in the industry here. Ocala is one of only five cities (four in the US and one in France) permitted under Chamber of Commerce guidelines to use the title, "Horse Capital of the World", based on annual revenue produced by the horse industry. 44,000 jobs are sustained by breeding, training, and related support of the equine industry, which generates over $2.2 billion in annual revenue. Postime Farms and Ocala serve as host to one of the largest horse shows in the country: H.I.T.S or "Horses in the Sun", a Dressage/Jumper event lasting about two months. It generates some 6 to 7 million dollars for the local Marion County economy each year. The show features classes for over 100 different breeds, including Tennessee Walker, Paso Fino, Morgan horse, SaddleBred, Draft horse and the American Quarter Horse. Other equine events in the area include cowboy mounted shooting by the Florida Outlaws, as well as endurance rides, barrel races, "extreme" cowboy events, jumper shows, trick shows, parades, draft pulls, rodeo events and more. In the last decades of the twentieth century, the greater Ocala area had one of the highest growth rates in the country for a city its size. The population of Marion County in 2000 was more than 250,000, up from under 100,000 in 1975. Many historic homes are preserved in Ocala's large residential Historic District, designated in 1984. East Fort King Street features many excellent examples of Victorian architecture. 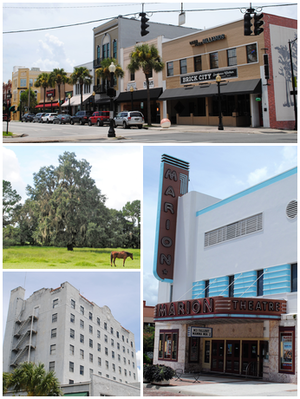 Ocala structures listed on the National Register of Historic Places include the Coca Cola Building, the E. C. Smith House, East Hall, the Marion Hotel, Mount Zion A.M.E. Church, the Ritz Historic Inn, and Union Train Station. The original Fort King site was designated as a National Historic Landmark in 2004. Ocala is governed by a five-member board of councillors and a mayor, all of which are elected on a nonpartisan basis. It has a council-manager form of government, relying on a manager hired by the city. The mayor sets policy but has few powers other than vetoing legislation passed by the council and tending to some duties involving the police department. The city manager handles most administrative and financial matters. Although a small majority of the city's registered voters are Democrats, Ocala voters have elected many Republicans to office. In the 2008 presidential election, John McCain carried both the city and the county, the latter by a landslide, although Florida as a whole voted for Democrat Barack Obama by a narrow margin. Ocala is located at 29°11′16″N 82°07′50″W﻿ / ﻿29.187704°N 82.130613°W﻿ / 29.187704; -82.130613. According to the United States Census Bureau, the city has a total area of 38.63 square miles (100.1 km2), all land. The surrounding farms are famous for their thoroughbred horses, in terrain similar to Kentucky bluegrass. Ocala is also known for nearby Silver Springs, Florida, site of one of the largest artesian spring formations in the world and Silver Springs Nature Theme Park, one of the earliest tourist attractions in Florida. The 110-mile (180 km) long Ocklawaha River flows north from Central Florida until it joins the St. Johns River near Palatka, Florida. Marion County is also home to the Ocala National Forest which was established in 1908 and is now the second largest national forest in the state. The Florida Trail, also known as the Florida National Scenic Trail, cuts through Ocala National Forest. Silver Springs State Park was formed as Silver River State Park in 1987, out of land the state purchased around the Silver Springs attraction to spare it from development. The state took over Silver Springs itself in 1993 and incorporated it into the park in 2013. Ocala has two distinct seasons: the dry season (October–May) and the wet season (June–September). During the dry season, there is almost uninterrupted sunshine with very little rainfall. In January, the morning low temperatures are often in the 30s and 40s, but the cloudless sunny weather typically warms the dry air up to near 70 by the afternoon. During the wet season, afternoon thunderstorms are a daily occurrence. These storms are often severe (unofficially, Ocala is known to have more cloud-to-ground lightning per square mile than any other city in the world). The typical morning low temperatures during the wet season are in the 70s and typical daytime high temperatures are in the 90s. Due to the city being relatively far away from the moderating influence of the Atlantic Ocean and the Gulf of Mexico, Ocala's summertime high temperatures are often the highest in the state while winter night temperatures are often the lowest compared to other cities on the peninsula. As of the 2010 through 2014 census, Ocala was 63.3% non Hispanic white, 20.4% African American, 11.7% Hispanic or Latino, 2.6% Asian, 2% all other. As of the census of 2000, there were 45,943 people, 18,646 households, and 11,280 families residing in the city. The population density was 1,189.2 per square mile (459.2/km2). There were 20,501 housing units at an average density of 530.7 per square mile (204.9/km2). The racial makeup of the city was 72.86% White, 22.14% African American, 0.36% Native American, 1.22% Asian, 0.02% Pacific Islander, 1.81% from other races, and 1.59% from two or more races. Hispanic or Latino of any race were 5.74% of the population. There were 18,646 households. 40.9% were married couples living together, 15.9% had a female householder with no husband present, and 39.5% were non-families. 33.0% of all households were made up of individuals and 15.0% had someone living alone who was 65 years of age or older. The average household size was 2.29 and the average family size was 2.91. In the city the population was spread out with 23.2% under the age of 18, 9.3% from 18 to 24, 26.2% from 25 to 44, 20.9% from 45 to 64, and 20.4% who were 65 years of age or older. The median age was 39 years. For every 100 females, there were 89.7 males. For every 100 females age 18 and over, there were 85.5 males. The median income for a household in the city was $30,888, and the median income for a family was $38,190. Males had a median income of $29,739 versus $24,367 for females. The per capita income for the city was $18,021. About 13.2% of families and 18.1% of the population were below the poverty line, including 28.6% of those under age 18 and 9.8% of those age 65 or over. Ocala is the headquarters of Emergency One, a worldwide designer and manufacturer of fire rescue vehicles. Ocala is home to the College of Central Florida, a member of the Florida College System, accredited by the Southern Association of Colleges and Schools Commission on Colleges. CF offers bachelor's degrees in Business and Organizational Management, Early Childhood Education, and Nursing, as well as associate degrees and certificates. The college offers specialty programs in equine studies, agribusiness, and logistics and supply chain management. It also has one of 21 campuses of Rasmussen College, a Higher Learning Commission regionally accredited post secondary institution. Webster University offers on-site, regionally accredited graduate degree programs in business and counseling at their Ocala Metropolitan Campus. Ocala Public Library – Headquarters for the Marion County Public Library System. Bubba Raceway Park is a 3/8-mile dirt oval track opened in 1952 and currently owned by radio host Bubba the Love Sponge. In 1995, Ocala was named an All-America City Award winner. Eastbound SR 40 as it approaches US 27-301-441 in Ocala. Several major highways pass through Ocala, including Interstate 75, U.S. Highway 27, U.S. Route 301, and U.S. Highway 441. Ocala was on the western leg of the historic Dixie Highway. Interstate 75 runs north and south across the western edge of the city, with interchanges at SR 200 (exit 350), SR 40 (exit 352), and US 27 (exit 354). U.S. Route 27 runs north and south throughout Ocala. It is multiplexed with US 301 and 441 until it reaches SR 492(Northwest 10th Street), then makes a sharp turn onto NW 10th Street then curves northwest through Williston, Perry, Tallahassee, and beyond. U.S. Route 301 is the main local north and south road through Ocala. It is multiplexed with US 27 until it reaches Northwest 10th Street, and with US 441 throughout the city. U.S. Route 441 is the main local north and south road through Ocala. It is multiplexed with US 27 until it reaches Northwest 10th Street, and with US 301 throughout the city. State Road 492 runs east and west through the northern part of the city from the northern terminus of the US 27 multiplex with US 301–441 to SR 40 just southwest of the Silver Springs city limit. State Road 40 runs east and west through Ocala. It spans from Rainbow Lakes Estates through Ocala National Forest to Ormond Beach in Volusia County, although a bi-county extension exists, spanning from Yankeetown in Levy County to Dunnellon, south of the western terminus of SR 40. State Road 464 runs east and west from SR 200 through the southeastern part of the city. Beyond the city limits, it continues southeast towards State Road 35, and continues as County Road 464. State Road 200 runs northeast and southwest from Hernando in Citrus County through US 27-301-441 where it becomes a "hidden state road" along US 301 until it reaches Callahan, and is multiplexed with SR A1A into Fernandina Beach. Ocala International Airport provides general aviation services to the community. Ocala Suntran provides bus service throughout select parts of the city. One of the major hubs for Suntran is the former Ocala Union Station, which served Amtrak trains until November 2004. Amtrak serves Ocala by bus connection to Jacksonville and Lakeland. Ocala is also served by Greyhound Bus Lines. West Port High School offers an arts-affiliated magnet program known as MCCA (Marion County Center for the Arts), and it focuses on instructing students in the arts. It is one of the better known arts magnet programs in Florida. ^ "2016 U.S. Gazetteer Files". United States Census Bureau. Retrieved July 7, 2017. ^ "American FactFinder". United States Census Bureau. Retrieved August 1, 2014. ^ a b "Population and Housing Unit Estimates". Retrieved March 28, 2019. ^ "Population Estimates". United States Census Bureau. Retrieved March 28, 2019. ^ "Metropolitan and Micropolitan Statistical Areas". U.S. Census Bureau. Retrieved March 28, 2019. ^ "Historic Highlights". City of Ocala. Archived from the original on January 14, 2008. Retrieved November 19, 2007. ^ McCarthy, Kevin; Jernigan, Ernest (2001). Ocala. p. 11. ISBN 0-7385-1377-6. ^ "Ocala City Charter" (PDF). City of Ocala. Archived from the original (XLS) on June 13, 2010. Retrieved February 3, 2010. ^ "2009 City of Ocala Run-Off Election Results" (XLS). Marion County Department of Elections. Retrieved February 3, 2010. ^ "2008 General Election Results" (XLS). Marion County Department of Elections. Retrieved February 3, 2010. ^ "The Florida Trail in the Ocala National Forest". Florida Department of Environmental Protection. Retrieved November 17, 2007. ^ "History". Thefriendsofsilverriver.org. Friends of Silver River. 2014. Retrieved April 8, 2014. ^ "NowData – NOAA Online Weather Data". National Oceanic and Atmospheric Administration. Retrieved February 28, 2012. ^ "City of Ocala, Florida: Comprehensive Annual Financial Report – For September 30, 2017" (PDF). ocalafl.org. p. 177. Retrieved January 18, 2019. ^ "A living education". Amblesideocala.com. Archived from the original on December 14, 2015. Retrieved December 17, 2015. ^ "Home". Thecornerstoneschool.org. December 8, 2015. Retrieved December 17, 2015. ^ "Meadowbrook Academy : Home". Mbaocala.org. Retrieved December 17, 2015. ^ "Home – Ocala Christian Academy". Ocacrusaders.com. Retrieved December 17, 2015. ^ "Ocala First Assembly of God – An A/G Church in North Central Florida – Ocala, FL". Ocalafirst.org. Retrieved December 17, 2015. ^ "Shiloh SDA Church School : Home". Antt40.adventistschoolconnect.org. Retrieved December 17, 2015. ^ "College of Central Florida". Cf.edu. Retrieved January 2, 2015. ^ "Rasmussen College Campuses". Rasmussen.edu. Retrieved January 11, 2013. ^ "Accreditation". Rasmussen.edu. Retrieved January 11, 2013. ^ "Webster University: Webster University: Ocala Metro Campus". Webster.edu. Retrieved December 18, 2012. ^ "Marion County Public Library System library directory". Marioncountyfl.org. Retrieved January 11, 2013. ^ "Past Winners of the All-America City Award". National Civic League. Archived from the original on October 11, 2007. Retrieved November 19, 2007. ^ "Friends Across the Ocean". City of Ocala. Archived from the original on March 11, 2012. Retrieved April 18, 2011. ^ "San Rossore Officially Sister City To Ocala". Thoroughbred Times. Retrieved July 16, 2007. "This event is just the beginning of a nice relationship between the city of Ocala and the city of Pisa and San Rossore," Fontanelli said in Italian during the ceremony. ^ "Joey Gilmore | Biography & History". AllMusic. Retrieved December 17, 2015. ^ Bohls, Kirk (May 13, 2012). "Travis Mays – Horns' 'home run hire' – has hit the recruiting trail running". statesman.com. Retrieved June 27, 2014. Wikivoyage has a travel guide for Ocala. Wikimedia Commons has media related to Ocala, Florida.